Thanks to iPhone 7 and iPhone 7 Plus, Apple has had an extremely impressive fourth quarter of 2016, resulting in the Cupertino-based company overtaking Samsung as the world’s largest smartphone maker. With 439 million smartphones shipped in total during Q4 2016, Apple accounted for a record-breaking 78.3 million of those units, with Samsung following closely behind with 77.5 million, leaving Apple accounting for a 17.8% market share during the quarter compared to Samsung’s 17.7% share. Market research firm Strategy Analytics has some extremely pleasing news for smartphone manufacturers, confirming that the industry has grown by approximately 3% annually to reach a total shipment of close to 1.5 billion units during 2016. Apple’s iPhone accounted for 215 million of those units, with Samsung’s range of devices making up an impressive 310 million. Those impressive numbers put Samsung on top as the overall shipper of devices during 2016, with Apple finishing the year strongly by shipping more units than Samsung in Q4 2016, with both strong iPhone 7 and iPhone 7 Plus sales as well as Note 7 going boom boom playing its part. 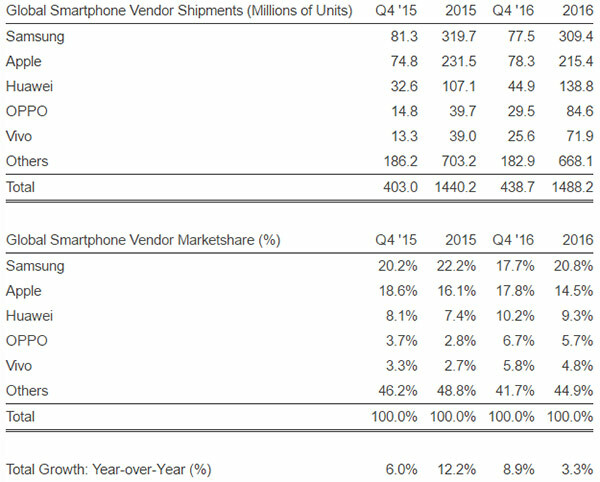 Apple shipped 78.3 million smartphones worldwide and captured 18 percent marketshare in Q4 2016, rising a steady 5 percent annually from 74.8 million units in Q4 2015. This was the iPhone’s best performance for over a year, as Apple capitalized on Samsung’s recent missteps. Samsung shipped 77.5 million smartphones worldwide in Q4 2016, dipping 5 percent annually from 81.3 million units in Q4 2015. Interestingly, Samsung’s year-long performance, which was ultimately lighted by the battery fiasco that befell the Galaxy Note 7 later in the year, resulted in the South Korean company capturing a 20.8% market share, which is the lowest level for the business since 2011. For comparison, during the previous year, Samsung finished with a 22.2% global share of the smartphone market. Apple’s market share has also fallen from 2015 levels, down from 16.1% to 14.5%, with Chinese companies like Huawei, OPPO and Vivo all sitting below 10%. The information makes its way into the public domain almost immediately after Apple held its latest earnings call to announce results of last quarter. Apple CEO Tim Cook has gone on record to state his belief that the smartphone is still in its infancy, predicting big things for iPhone going forward, but also publicly declaring the importance for app developers to keep innovating and building cutting-edge solutions that ultimately add value to the smartphone proposition. 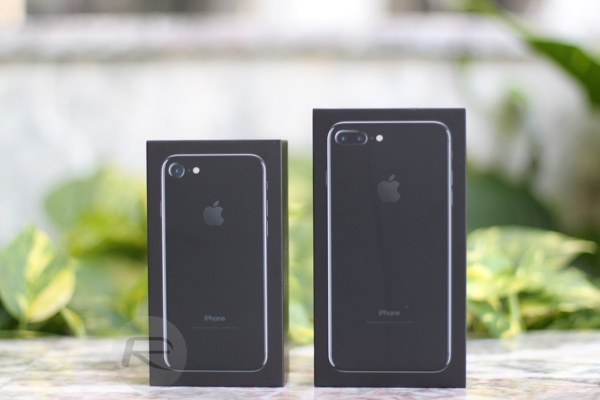 iPhone 7 and iPhone 7 Plus have proven to be extremely popular for Apple, it just remains to be seen if the next-generation is enough of a radical redesign to continue that upward trend. It is not the iphone 7, but the galaxynote 7 fault! iPhone 7 is a total fail for me. Especially no headphone Jack (cant charge and listen at same time at all)..ridiculous! Right, these articles are so fake..Fake News! Samsung to blame, nothing to do with Apples product. Huawei will catch Apple in a couple of years. Bias website create fake news.. Sad.. So very little difference even though samsung had a total device recall lol. LOL Samsung releases a new garbage device every other week. The lunacy is strong with this one. The differents is very noticeable when it comes to profits. You have to read it only way to know if the person if reporting fake news lol. Fan boy comment I had the iphone since the beginning n I saw myself grow to hate it more n more every new model until I had enough n just went to android now I’m couldn’t be happier. I was gifted an iphone 7plus i returned for an ipad apple didnt want to give me refund, I use s7 edge it just has more features. Samsungs downfall this time around was the launch of the note 7. Don’t know why you refer to yourself as “this one”, but I would definitely agree. That’s quite apparent because of the whole note 7 debacle, s7 and s7 edge both sold well. What relevance is that to what I said, samsung have low, mid and flagship to cater for different markets, every other manufacturer such as Sony, LG, HTC, Motorola have the same policy.